The following is a guest post by Mark McClusky, the editor of Wired.com and founding editor of Wired Playbook. Previously, he was a reporter at Sports Illustrated and a member of the baseball analytics collective, Baseball Prospectus. Can “juicing” for performance enhancement sometimes involve juice alone? Beet juice, spinach, celery, or chard, perhaps? In this post, we look at fact versus fiction, dosing, and results you can potentially replicate. I’ve added some thoughts of my own in brackets. In other random news, I’m finally on Instagram! Here I am, and here is a pic of Tony Robbins palming my entire face. No, today’s hottest sports drink is deep red and frothy, and tastes a little bit like dirt. Drink the recommended dosage, and you may find that your urine and feces become pink from taking it. But you also might find that you’re faster in your races. Ladies and gentlemen, I give you beet juice. The key researcher into beet juice’s effect on athletes is Andy Jones, who became well known in sports science circles through his work with marathon world record holder Paula Radcliffe. How much has Jones, a professor at the University of Exeter, in the UK, become associated with the beverage? His Twitter handle is @andybeetroot. That combination does, in fact, seem to offer a strong performance boost for a particular kind of event. Jones’s group has published a study that seems to show a nearly 3 percent gain for athletes involved in efforts that last between five and thirty minutes. We’re commonly told that nitrates and nitrites are potentially dangerous, and that we should limit our consumption of them. The fear is that inside the body, nitrates and nitrites can combine with meat proteins to form compounds known as nitrosamines. There is some evidence that these compounds are carcinogenic, which is the reason that most health organizations advise that we limit our intake of cured meats like bacon and hot dogs, which use sodium nitrite in the curing process. The protocol that’s been studied the most by sports scientists involves about 300 mg of nitrate delivered as beetroot juice between 2 and 2.5 hours before exercise. Jones and his group did a study the looked at the dose-response curve for beetroot juice—more juice did have a greater effect on nitrite levels in the blood, although there seemed to be a diminishing return when it came to the actual performance boost. The optimal level in their study was two concentrated shots that are the equivalent of about 600 mL of juice. Of course, that raises an important question: is “statistical significance” [versus clinical or practical, for instance] the right measurement to use when we’re evaluating a study like this, especially for athletic performance? In the 1920s, English statistician Ronald Fisher created the concept of the p-value. The idea behind the p-value is that it’s an expression of the probability that the result see in an experiment is due to random chance [p-value], rather than the result of an intervention or treatment. So, when you’re doing a study that seeks to show the effect of beet juice on cycling time trial performance, you start out assuming that it will not have an effect—this is called the “null hypothesis.” [i.e. It will not work] After collecting your data and doing your analysis, you crunch the numbers and come up with a p-value. A smaller p-value means that the evidence against the null hypothesis is better; that the effect of the intervention (in this case, beet juice consumption) is more likely. The p-value tries to express the reliability of the conclusion that researchers draw from their experimental data. Fisher argued that a p-value of less than or equal to 0.05 was a good informal line to draw when it came to evaluating research. That means that there is a 5 percent or lower chance that the null hypothesis would be true (i.e. <5% chance that the results are due to chance alone and not an intervention like beet juice), therefore giving a 19 out of 20 chance that the experimental intervention was responsible for the effect seen in the data. In general, if you’re a scientist and you do a study where p is greater than 0.05, you’re unlikely to ever see it published. If p is 0.05 or below, it’s assumed by many to significant; most journals follow this cutoff. Will Hopkins, a New Zealand sports scientist and statistics guru who has written a massive primer on the use of statistics in scientific papers, advocates a different way of evaluating sports science research. The issue with the use of p-values is that if you have a small sample size for your experiment, you need a very strong effect to cross the threshold of statistical significance. But when you’re trying to do studies on elite athletes, you have, by definition, a pretty small cohort. And if you are studying something that might only have a small effect, you’re probably not going to get over the p-value threshold with that sample size. Instead of a binary view, where a result is either significant or not, he talks about the likelihood of a benefit or negative effect. So, he’ll express the results of a study in terms of it being very likely beneficial, or almost certainly not harmful. Because when researchers and coaches are working with elite athletes, they have to conform to that central principle of medical ethics: First, do no harm. In conclusion, acute dietary supplementation with beetroot juice did not significantly improve 50 mile TT [time trial] performance in well-trained cyclists. It is possible that the better training status of the cyclists in this study might reduce the physiological and performance response to NO3- [nitrate] supplementation compared with the moderately trained cyclists tested in earlier studies. Compared to PL [placebo], BR [beetroot juice] supplementation resulted in a group mean reduction in completion time for the 50 mile TT of 0.8 % or 1.2 min (PL: 137.9 ± 6.4 vs. BR: 136.7 ± 5.6 min), but this difference did not attain statistical significance (P > 0.05). So it wasn’t that the riders didn’t improve. When you look at the mean, they improved by 0.8 percent. But the sample size was small, and the improvement was small, so the p-value was above 0.05. That’s why the authors correctly note that it didn’t attain statistical significance. It is noteworthy, however, that although the group mean improvement in 50 mile TT performance did not attain statistical significance, an improvement in completion time of 0.8 % would likely to be practically meaningful during competition. And digging even deeper into the study, you find something else. Of the eight subjects, five of them had their level of plasma nitrite increase by 30 percent or more after drinking the beet juice, which is what you’d expect when you drink something rich in nitrates. But the other three riders didn’t get the same increase in nitrite in their blood—in fact, one actually had a decrease. This sort of individual difference in response is actually a common phenomena across lots of things, from nutrition to how we react to a workout. (In my book, Faster, Higher, Stronger, I argue that those individual differences mean that each of us is doing an experiment with just one subject, a perspective that’s near and dear to many of the readers of this blog and Tim’s books). When you look at just the responders to beet juice, the improvements look very different. They had a mean time reduction of 2 percent, which would be more in line with what previous studies have found. One other interesting result of Jones’s research is that beet juice seems to be a more effective ergogenic aid for regular athletes than it is for elite performers. “If you think of the things beet juice helps with, like blood flow and mitochondrial function, in elite athletes, those abilities are pretty well developed,” says Jones. “So there, you do have an issue of diminishing returns—any ergogenic aid might have a smaller benefit in the elite. But even if the benefit is just 0.1 of a percent, it’s probably worth trying.” This is one case in which regular folks like you and me might get more out of beet juice than an Olympian, but as Jones notes, even the small chance of a benefit for that elite athlete make it worth trying. And they certainly have been. Jones tells me just about every top nation at the 2012 Olympics was using beet juice with its athletes. “It was actually pretty difficult to buy beet juice within ten miles of London,” he says. Beet juice’s benefits are best established for events that last from five to 30 minutes. Lots of athletic events fall into that time frame, from middle distance swimming and running to rowing, all the way up to 5K, and even 10K if you’re a fast runner. Research has pegged these gains at around 3 percent. Most research has been done with the equivalent of 500-600 mL of beet root juice consumed between 2 and 2.5 hours before the event. (So, for instance, the research on longer events didn’t include athletes re-dosing due to the length of the effort). This can be in the form of regular juice, while some athletes have started to turn to concentrated beet juice which makes it easier to get the nitrates without so much bulk in the stomach. Team sports have been studied less than individual sports, but there is some research that indicates that beet juice can improve performance in the so-called Yo-Yo recovery test, which simulates the stop and start action that you get in sports like football, basketball, and soccer. Many sports teams are starting to use beet juice. As discussed above, the data on endurance events over 30 minutes isn’t as clear as the data for shorter events. But there’s no evidence of harm to performance with the standard dosages. So feel free to try it and see if you’re a responder or non-responder. Speaking of responders and non-responders—keep track of your data! You won’t be able to correct for the placebo effect when you use beet juice, but by tracking your performance (whether it’s a training log, a fitness tracking device, or a site like Strava), you can see if you’re getting a benefit, or if you’re just #pissingrainbows for no reason. My book, Faster, Higher, Stronger: How Sports Science Is Creating a New Generation of Superathletes, is an in-depth look at the science and technology that allows the world’s best athletes to push the boundaries of human performance. Posted on: October 27, 2014. Interesting ready. I have to say I have personally see a positive effect taking Greens like Green Vibrance and also taking Turmeric. Sorry for the typos everyone. This may sound dumb coming from a nutritionist, but I’m a firm believer that nature gives us clues. For example, avocados are good for your testicles and celery is good for erections. No joke. Beets are the color of blood. Go figure. I would think beet roots would be good for erections too if it converts into NO. Viagra works on the NO pathways. Good to know. Next romantic dinner = oysters served with a citrusy guacamole and a beet-and-celery slaw. Wow!! Good to know as a male for sure!! Thank you Ben! I am glad I stocked up on two bags of avocados recently .. yumm!! Thats interesting, because many years ago I received a forwarded email that said something similar. I can only confirm your statement, Ben. I’m a woman and my testicels and erections have improved greatly by eating more avocados and celery. 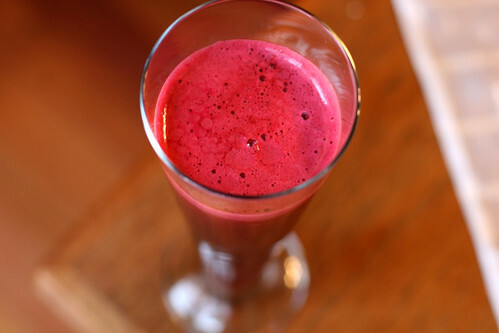 Have you experimented with beet juice or juice cleanses yourself? Fantastic article! Given that I’m a raving Tim fan and have gained a recent interest in the possible performance enhancing effects of beet juice (I started my own juice company — inBloom Juicery) this article was a great change up to the usual 4HWW blog post and exactly what I was looking for. Would love to see more posts about nutrition and natural performance enhancers in the future. JR: Glad you liked the article! I used to be goalie in ball hockey (like ice hockey but in a gym & with an orange ball that leave bruises the size of pumpkin where it hits) and back then I made a few experiments with foods, one of which i found VERY interesting and that got me more and more into eating better. I was attending university back then and was always brutally tired before playing games, so i often took an energy drink prior to a game… And each times I noticed it did NOT “give me wings” but ratter make me nervous, shaky and actually slower then without energy drink. But at one point, i decided to do an experiment and not take the energy drink. I instead replaced it with a fresh vegetable juice 1 hours prior to the game that i made with a cheap juice extractor. The results were nothing short of phenomenal: i was way calmer physically and mentally, my reflexes were just ever slightly better and I almost stopped everything. In hockey, especially close-quarter ball hockey, reflexes are everything and getting that extra fraction of a second to move your arm to make a stop is the difference between a goal or not. The way i felt and i perform were truly, markedly, improved. To make sure i was not crazy, i did many other test: tried energy drinks again, then nothing at all, then different types of dinners, more sleep, etc but most things made close to no difference. Somehow, the fresh juice was literally like a magic, ultra secret formula. If i’d had a team (any sport) worth 300+ million$, I’d make that into the pre-game routine for sure: everyone gets a fresh vegetable juice 1 hour before the game. The results are just stunning. I might conclude in saying that non only was i much sharper in my reflexes, but after 3 hours of getting up and down goal-tending, and after the official game ended, i STILL wanted to play. I had seemingly endless energy. The best way i can put it is that you just feel awesome, awake, steady and strong energy. The end result was that when i drank vegetable juice 1 hour before the game, i won more games and did not feel like dying after 3 hours. The juice was mostly any vegetable in my fridge, but my preferred version is now beets, carrots, potato, apple, celery and fresh ginger (for a good kick). BTW: tim, i just saw your archery pics on instagram and its crazy coincidence, because after 20 years without using a bow, i decided to start shopping for a new ancient bow. I’m hesitating between the longbow, the Yumi japanese bow and the mongol bow. Did you try any of those. I want to buy them directly from an artisan. I just love archery as a form of meditative art. BTW2: i noticed that all your amazon affiliate links are only .com and if i click on it, find the product interesting and switch back to amazon.ca (canada), then you won’t get any commission. With that in mind, and with your traffic, if i’d be you, i’d add a little script that check the IP and find the country of the user and replace all links to their country of origin (you’ll need to open an amazon account in each countries). That could bring in a little more revenues from there. If you do so, don’t forget to also change the referal ID since it’ll be different for each country. BTW3: i think drinking only beet juice is not optimal. i would really opt for a full broad-range vegetable juice like the one above for optimum results. Just came across this on June 13, 2017. What a great story, Joel. Thank you. Been on beet juice for 6 mos. and didn’t notice much except cholesterol dropped 25%, but may be the shredded wheat. Thanks. Great detail. We have to take everything with the recommended grain of salt 🙂 Yes, the 1.2 minute difference does not reach statistical significance by the book, but it really can make a difference between the first and 20th place of a time trial race. That would make it really significant. P.S. for Tim : You may wanna check Wahls’ Protocol, as it describes an elimination diet (paleo-keto friendly) that could potentially help you with your gut issue. One important thing I missed is instructions on how to actually use/drink it (and whether this was done in the studies), because the NO3 of the juice needs to be converted to NO2 by your saliva first, in order for your stomach to be able to turn the NO2 into the performance enhancing NO. If you swallow it right away, you won’t get the NO. Oh, and Rucola/Arugula has 4 times the nitrates beetroot has, so if you’re fond of eating (and chewing!) salads, you’re doing ok.
You actually can just drink it normally. You’re right that bacteria in saliva convert NO3 to NO2, but you don’t have to do anything strange to get them to work. But you do need to have those bacteria — if you rinse with a strong mouthwash, you can kill off those bacteria, and you won’t get the benefits. And while arugula has a high level of nitrates, it’s 4 times by weight — and getting the equivalent of 500mL of beet juice from arugula is one massive, massive salad! So why not just make spinach or arugula juice? Thus you would have more nitrates for a given volume? Mark, so are you saying that one should avoid a daily Listerine rinse ? Or is it all about “timing” it ? I’ve always done a daily rinse since i thought it was good for keeping bad breath away…thanx in advance for a reply ! My friend who got me interested in diet and exercise as a science always ate a lot of beets. I don’t think I ever saw him drinking the juice, but he ate a decent amount of beets. I think for the study of high performance you might not want to look at whether something is statistically significant, but rather run your own tests, since everyone is different and that would lead to a more accurate, personalized result. Another area where this is brought up often is with the NoFap movement. There are tons of proponents of masturbation saying that there’s no statistically significant proof of any benefits from abstaining from masturbation (Except a small rise in testosterone for the first week) but, there are TONS of anecdotal stories of people who abstained for a couple weeks, or a month and then experienced tremendous personal benefits. Overall, I guess that’s my main point, is that it’s better to test hypotheses out for yourself, rather than just believing what is statistically significant. (Granted that it won’t kill you at least, it’s safe to assume that hemlock would have the same effect on me as it did on Socrates and the thousands of other people who died.) That’s kind of what I write about on my blog, but with regards to lifestyle and traveling, inspired by you Mr. Ferriss. How much beetroot would you have to eat in order to achieve the 600ml dosage requirements? Also, would I need to increase the amount of time I consume the beetroot before an event in order to account for digestion? Tim, what if you give us an audio version of every blog post. Have a guest reader. I like to listen to the podcast when I go for a long walk. It would be nice to do the same with the blog post. I’m glad you mentioned pink feces. Don’t get freaked out when you wipe for the next couple days after ingesting like I did! I think it’s significant to differentiate between the 5-30 min activity and the endurance activity. So often, we read the headlines and that’s it. So now beet juice is the thing that everyone is using, almost indiscriminately. The effect of the nitrates is best for power and for quick activity. It might help that marathoner, but we don’t have good research (significance level aside). What does this mean for resistance training? Any single brand you would recommend for the average joe getting into beet juice? Hi Tim, Doesn’t the sucrose play a large part in the energy boost that comes from beets? … surprised I didn’t see that anywhere in here … or, perhaps I missed it? At least one comparison here was normal beet juice controlled against nitrate-depleted beet juice, so sucrose should ostensibly have been equal between the two. Beets and beet juice helped me immensely when I was going through fluoroquiolone toxicity – a toxic reaction to cipro that left me unable to walk more than a block (I was doing crossfit before I took cipro). The nitric oxide / peroxynitrite cycle is likely a big factor in autoimmune diseases, chronic fatigue syndrome / M.E., fibromyalgia and other diseases. http://floxiehope.com/2014/08/05/cellular-damage-fluoroquinolones/ I found it paradoxical that beets, which are full of nitric oxide, helped me so much until I realized that the peroxynitrite was depleting my body of nitric oxide. Athletes should never take fluoroquinolones. Ever. I was looking into Beet Juice, thanks for doing the research on this. I was looking at it for everyday performance. Great Post! I was recently looking into beet juice for every day performance. Thanks for doing the research. I am interested in using beet juice for stand up paddleboarding! Sweet!! Arugula has 4 times the amount of nitrate that beetroot does, but it tastes hideous in a smoothie. leafy greens have higher nitrate levels if you are watching your sugar / fructose intake. Thanks, Jonathan. Have you tried any of the other sources in a smoothie (chard, etc.)? Personally I go with spinach in a smoothie. If you ad a bit of sweetener (stevia), you can mask any negative taste to spinach – however spinach isn’t that bad. You can also purchase off amazon in a powder form. I throw in spinach, bok choy, and even broccoli in a smoothie with Amasai yogurt, and a slew of powders/seeds/meal, with no adverse impact on taste. Any thoughts as to whether or not consuming beet juice would help reduce high blood pressure, since the post indicates that the nitric acid “…causes blood vessels to dilate, so you can provide more blood through them,”? This is awesome. I really appreciate the breakdown of the statistical significance of the study. So many conclusions in so many articles we run into are based on unfortunate interpretations of the experiment. The “what does this mean in the real world” is the key. Might have to try some beet juice before the gym! Thank you John. Glad you liked the stats part — it’s amazing how often we mis-interpret results like these. Always a joy to read your articles. Well thought out, examined, and critical. My question is: How big are the chances for negative side effects? A friend of mine, with whom I have done many ultra trail runs, when he saw me drinking beet juice before a marathon said that this stuff is quite heavy in the kidneys. True, not true? I’d love to hear Mark weigh in on this, if he hasn’t already in the comments. Mark, is there any oxalate-related risk of kidney problems with drinking the doses used in these protocols, if one were to do so 3-4x per week? So, two points. Right now, the research on performance has been around acute usage of beet juice before competitive events. So 3-4x a week would be much more regular use of that sort of protocol. Andy Jones is starting to study chronic usage, but no papers yet. Turning to oxalate — beets are very high, yes. But the relationship between high-oxalate diet and stones is a little complicated. About 20 percent of people who form calcium oxalate stones have high levels of oxalate in their urine, so they would benefit from restricting foods high in oxalate. But if you don’t have a high level of oxalate in the urine associated with your stones, restricting intake won’t really have an effect (good primer from University of Wisconsin Public Health: http://www.uwhealth.org/urology/oxalate/11252). So — I’m not a doctor. If you’re someone with a history of calcium oxalate kidney stones, I’d be a little wary of too much beet juice. It would be worth getting urine testing done. But if you don’t have such a history, right now there’s no evidence of any big issues. I have been juicing and running for 2 years now and the improvement is quite astounding. I was diagnosed with prostate cancer 2 years back and came into contact with Don Tolman. He put me on a particular protocol that included rolled oats for breakfast with lemon squeezed on top with flaxseed and wheatgerm oil, lots of broccoli and brazil nuts and fasting and juicing. 6 months later cancer gone and I am fitter and stronger than ever. He recommended Cabala juice which is carrots 3 x apples 1 x beetroot and 1 x lemon. Beetroot juice is amazing and I now have it with carrot and apple, ginger and turmeric daily. The ginger and turmeric help with any inflammation in the body. Thanks for the tip about the Ruby Reds Grapefruit juice for lowering blood pressure. I will check it out. After being on the meds for 2 months and feeling horrible, I got off, hired an integrative physician, (Dr. Isaac Jones, Altanta GA), lost 30 lbs (after already being relatively fit) and have made some progress with BP, and cholesterol. Still got a way to go. Thank you, John R.
This is a strong article and the author clearly did their homework, I appreciate everything said here. There aren’t annoying superlatives like many articles out there. However, a big big big factor is missing here: The types of testing protocols used in the studies! Beets are too sweet to be juicing, long term the sweetness is probably going to be too big a deterrent for casual fitness people. Competitive athletes can take the sugar hit, most likely, everyone else would probably do better drinking green juices… whatcha think? Beet kvass is sold at my local grocery store…is that very similar to beet juice? I’ve searched the web but I can’t seem to find a comparative article between juice and kvass. Often a drug that only works in 5 or 10% of a cohort gets overlooked because there is no statistical significance, but if it worked in 10 people, that’s 10 people’s lives that can be improved. That’s worth something! Check out this book: The Cult of Statistical Significance: How the Standard Error Costs Us Jobs, Justice, and Lives (Economics, Cognition, and Society). Also, the point of differentiating responders versus nonresponders is huge! Being able to check nitrogen levels in the blood of the athletes was a big boost to the paper. I had the same problem with methylene blue, which is also a mitochondrial enhancer, I was looking at tau protein degradation by chaperone proteins inhibited by methylene blue, and I could see a robust drug effect when I separated responders versus non-responders. Great article! Love all the science stuff you have been putting lately Tim! Often times a drug is overlooked because it only works in 5 to 10% of a cohort. But if it works in 10 people, that’s 10 people whose lives can be ameliorated! Also, the point about checking responders versus nonresponders is huge! I think that looking at the blood levels of nitrogen really boosted that paper. I had the same problem with methylene blue, which is also a mitochondrial enhancer. Once I had brain levels of methylene blue I could check responders versus not responders and see a huge difference in cognitive performance. I’m loving all the science articles you been posting recently Tim! Tim you should be drinking this daily and when the cranberries come online (get in season) have these too, All red fruits strengthen kidneys and immune health system. Garlic and ginger gentle tonics too but nothing beats the beet. I’ve definitely noticed improvements in performance using products like Greens (ItWorks) but I’m going to have to try this next time. Great read Tim. I would like to start by saying ‘don’t try this at home’ I hate cliches but honestly don’t. Late July 2013 after having a period of over indulgence and luxurious diet. I decided to get back to normality and kick start a detox with a juice fast. First 2 days were a mixture of fruit juice and carrot juice and H2O. After reading the performance enhancing and blood pressure lowering effects of beetroot, the next 2 days a drank 4litres of beetroot juice along with a clean eating plan. I felt amazing and the positive novelty collateral of purple urine for 3 days was great. I then started to get sciatica with left flank pain. As an osteopath I got checked out quick, it didn’t seem to be coming from MSK source. 2 days later I had bilateral loin pain and if felt like someone was gripping my kidneys. Turns out I had acute renal failure with no obvious reason that they could explain. When I told them about the beetroot juice they smirked, grinned and laughed at the idea of beetroot juice being the causing factor. Could it be or not??? Are beets this powerful? Who knows but I thought I would share. Mike: I would like to know much more about the beet juice you drank, but I drink fermented BEET KVASS that I ferment in my kitchen. I drink Beet Kvass as an energy booster, tonic, detox agent, and with the concept of “food as medicine.” I started slowly to allow my body to adapt to it over a period of time. Also, we’d need to know if it was juice you purchased, juiced yourself or fermented at home. I starting drinking the Beet Kvass fermented from organically grown beets two years ago. I started with 1 TBSP. a day so I could monitor my body’s response. Now, two years later I would NEVER drink 4 liters of Beet Kvass. I also know the source of my beets and I either grow them myself or have a relationship with the farmer/local food source. Further, the Beet Kvass I ferment at home has no chemicals in it, nor has it been pasteurized or heated in any way. I’d be interested in knowing the brand and the details on the label so I can see what’s going on with the product. You were fortunate and had the good sense to go to the doctor, so you recovered. We (foodies who ferment and consult with clients on their nutritional programs) would never recommend that anyone drink 4 liters of fermented or juiced organic beet juice in any form. Detoxification of the human body requires a gentle and slow process under the supervision of someone who understands you and your body as well as the intent of your detox. Well Mark, I’m gonna have to give this beet juice a try. I had heard about the benefits, but this article helped convince me. Thanks for the great article. If the source of the enhancing boost is nitrate/nitrate. Does eating cold cuts turkey ham or even just bacon give the same benefit? Tim and Mark: Je suis Fermentista! Ya ya… you can do better than tell your readers about beet shots, beet juice in a bottle, and blah blah. For hundreds of years the people of Russia have been drinking BEET KVASS, a magical drink that any athlete, mom, dad or child can make in their own kitchens! Assuming that an athlete is a disciplined and educated person who can easily understand that organic beets, a few quart jars and some Himalayan salt can be “brewed” in a jar and transferred to a clean, glass sports drink bottle (non-plastic is better) and carried on a bike, to an event, to the gym, on a plane or to a training facility. Why would any decent coach provide “beet shots” or “bottled beet juice” knowing that it takes a few minutes to pick-up organic beets, salt and pure water from a local source, 10 minutes to wash and slice them and pop them into a wide mouth jar to ferment? The little secret I’m trying to let you in on is this: the beets in the studies that come from bottles. even those juiced at home with a Champion juicer are not likely organically grown, nor do they provide the powerful probiotics to the gut that are the natural by-product and power source of fermentation! If you want to do some real testing of the POWER of organic, fermented red and gold beets, I’m here to teach you how to ferment your own beets or provide you with a local fermentista to brew for you! What’s the difference? Fresh, fermented kvass, is a miracle source of energy and everything a professional athlete, Olympic wanna be, or a mom and dad need to brew for the family that wants to protect their children from sugar soda, obesity and diabetes. E-mail or send your contact information to me via this comment and you can try the real thing. Don’t let some corporate entity convince you that you’ll get the same nutrition, power and energy from “beet juice in a bottle or as a shot in a bottle” that has been pasteurized and processed because it simply isn’t true. I can guarantee “brewed in your kitchen, live kvass with probiotics is a bargain and superior! You spend $3.00 to $4.00 for the beets that produce 2 ferments (4 quarts of live probiotic Beet Kvass) + a the cost of the glass jar. The power Beet Kvass is a bargain if you follow the links to the corporate so called beet juice and the prices. No comparison! Further, no bottled beet juice can take the place of Mother Earth’s organically grown beets from a local source or your own back yard! Trust me. I’ve been fermenting and drinking it daily for two years while getting well from a debilitating autoimmune disease and a lifetime of eating processed foods. On top of that, the weight loss I experienced while getting well has been unbelievable. Beet Kvass and its powerful probiotics became my “medicine” of choice. concerning your post about Beet Kvass. Don, happy to teach you… We can get al of our team healthy so we can win the 2020 election and do a lot for future generations and families with kids. I am more than happy to post about BEET KVASS! You can learn. It’s simple. I have to get to bed… it’s 2 a.m. and I’m exhausted. BTW, what happened to my Bernie post? I hope it didn’t just go melt away in the universe. LOVE and all of that…. How many beets per smoothy should I use? If you don’t want to juice beets try a pure powdered beet juice product like BeetBoost, which also contains tart cherry juice. the P value won’t ‘fall apart’ when comparing elite athletes. The range of different results will be very small which will also make the standard deviation very small. and then when calculating P the difference from the mean will be compared to the SD. so a very small SD will make a very small difference in the results still be statistically significant. Beets are also very high in sugar, which also boosts performance. ?? Tim, you might be interested in an article called ‘Sunday Supplement’ written by David Bradford. It includes a Q & A with Prof Andrew Jones. First point, a new study conducted Dr. Lex Verdijk shows concentrated beet shots “effectively improve” performance in trained athletes — as long as the nitrate dose is high enough. Pretty exciting stuff. The University of Maastricht research team studied 32 elite soccer players — consuming two 2.3 oz concentrated beet juice shots (800 mg of nitrate) over six days yielded significant performance improvement. Second point: Not all beet juices or beet supplements are the same! The extensive body of clinical research on beets was performed with concentrated beet shots that delivered a dose of 400mg of dietary nitrate. The unfortunate fact is that most beet products on the marketplace fail to specify the quantity of nitrate they deliver per serving. Indeed, most of beet juices and powders are highly unpredictable, with nitrate content varying so widely that it can take between 6 to 20 fl.oz of juice to contain the 400mg nitrate dose.